Okay, so no one imagined I could squeeze a “stewardship sermon” into a Lenten devotional book! Surely you remember the story of Joseph, sold into slavery by his brothers, only to find favor with the Pharaoh in Egypt. It seems Pharaoh had a dream that no one could interpret but Joseph. Joseph understood that there would be seven years of plenty in Egypt and then seven years of famine. 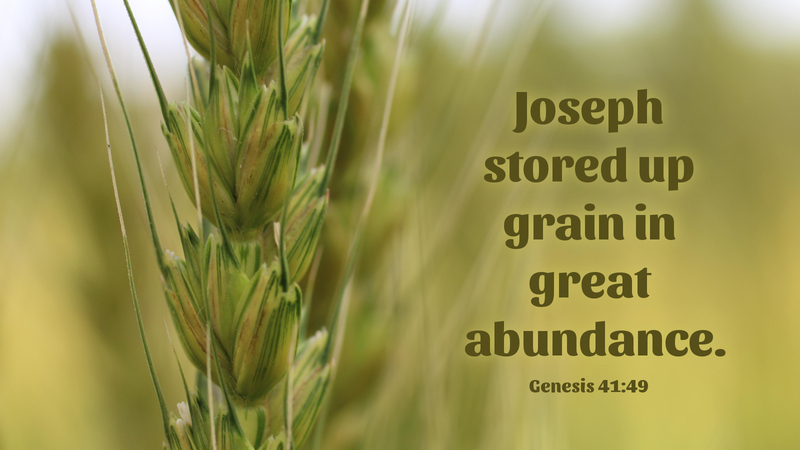 Joseph then used the seven years of plenty to collect and store food for the seven years of famine. When the famine came, it affected all the lands—except Egypt, where there was bread and food because of Joseph’s wisdom. If only we would learn the lesson of Joseph. Our grandparents tried to teach us that lesson, encouraging us to “save for a rainy day”—putting away resources in good times to get us through difficult times. Still, many Americans live hand-to-mouth, from paycheck-to-paycheck. We know that many are not good stewards, planning ahead in their finances. We would do well to learn the lesson of Joseph! And why would this be appropriate for a Lenten devotion? Since Lent is a time of reflection and re-orientation in life, this is a great time to give thought to our finances, resources and how we use what God has given us. Throughout the Bible, God asks of his people that they return at least ten percent, a tithe, of what they have as a first-fruits thank-offering to Him who is the creator and giver of all. The reality is most Christians have a hard time returning one percent or two percent of their income and resources to God. Most of us spend what we make, so there is little to return to God in offering, even if we wanted to. Lent is a wonderful time to set some financial goals, to make a strategy for how we might reduce our debt, have more disposable income, and be able to give, not just to God, but to the many benevolent causes we might like to support. Prayer: Gracious and Giving God, give me the strength and courage to become a good and faithful steward of all that you have given me; through Jesus Christ our Lord. Amen. If a person wants to give 10% of his income, he can; but if he does not want to give, there will always be something else for which to use the money. Sometimes the decision was made without a great deal of thought long before the money was earned–in the case of spending borrowed money, but it was a choice nevertheless. Our use of the money we get is a declaration of our priorities–what do we “want” most? Our God is able to supply all of our needs, but He does not promise to supply all of our wants. Thrivent Financial has developed excellent free resources to help people learn the principles of good financial stewardship, but not enough churches take advantage of the programs.